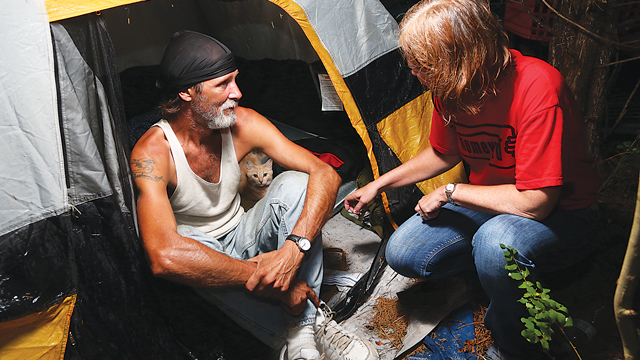 Twice a year, Homeward leads the community in a regional point-in-time (PIT) count. This is a 1-day census of people experiencing homelessness in the Richmond region. The activities for the 2019 winter PIT count are on the evening of Wednesday, January 23 and all day Thursday, January 24. The count helps Homeward understand how many people are experiencing homelessness in the community on a given day, but it is much more than a simple count. The data collected helps build a community-wide, data-driven narrative of need. This ensures that programs and services are designed as solutions to the actual barriers to stable housing faced by neighbors in the community experiencing homelessness. There are over 200 volunteer slots available across two days of activities. This is a to deepen your support and understanding of the region’s collaborative network of homeless services. Follow this link to register: Homeward sign-up and more information. It is common for children to be curious about homelessness and panhandlers, as it can be hard to imagine that someone does not have a permanent place to live, regular access to meals, or a steady income. Many children are able to take their homes for granted, but this is not the reality for over 3,000 of our neighbors who experience homelessness each year. These individuals and families facing a housing crisis can be found sleeping in emergency shelters, in their cars, under bridges, or in the woods, and are often most visible to us as panhandlers on street corners. Richmond-based Homeward is the backbone support agency of a regional collective effort committed to preventing and ending homelessness. “In order for our community to successfully address the crisis of homelessness, we must first acknowledge that poverty exists, is pervasive, and that it’s sad and unfair,” says Kelly King Horne, executive director of Homeward. Horne says homelessness is just one manifestation of the issue of poverty, but it can have a significant impact on education, health, employment, and criminal justice outcomes. When it comes to homelessness, parents want to teach their kids about compassion, empathy, and helping those in need. When we are confronted with a direct request for assistance, such as from a panhandler, it can be difficult to say no without looking mean-spirited or feeling guilty. Children see change in the car or cash in our wallets, and want to be able to help. Wanting to help is a good thing, but Horne says getting involved with an established homeless services crisis response system in Richmond has a much bigger impact than giving money directly to someone in need. There is good news, however, as the solution to homelessness is relatively simple: housing. To meet this need, Greater Richmond is fortunate to have a data-driven and collaborative network of homeless services providers formally known as the Greater Richmond Continuum of Care (GRCoC) with Homeward as its lead agent. The GRCoC was designed to address homelessness through a coordinated community-based process of identifying needs and building a system of housing and services to help meet those needs. Areas of service includes the city of Richmond, and the counties of Chesterfield, Hanover, Henrico, Powhatan, Goochland, New Kent, and Charles City. Homeward was created in 1998 out of a need to coordinate and streamline services, better understand the needs of people experiencing homelessness, and to provide thought leadership on system changes so the region might collectively move toward making homelessness rare, brief, and non-recurring. Horne reports that due to the efforts of Homeward, the region has seen a 33.8 percent decrease in the number of people experiencing homelessness since 2009. Additionally, through the system-wide implementation of practices like rapid re-housing and coordinated assessment, “We have been able to reduce the median length of homelessness for families by 50 percent, and become the first state in the country to functionally end veteran homelessness,” says Horne. Despite these successes, Horne admits there is still much more work to be done. Homeward is currently bringing the community together around the goals of ending chronic homelessness by 2017 and family homelessness by 2020. “We know that to move forward, we need to break the cycle of individuals coming in and out of homeless services over time by working to ensure they are equipped to sustain housing,” Horne says. These resource sheets, which are available to the public at Homeward’s website, contain helpful information about shelters, crisis services, and community meal programs. “Greater Richmond is fortunate to have some of the best homeless services providers in the country. We want to make sure we’re building bridges to accessing these services, and that as a community, we’re strengthening its capacity to effectively respond to the needs of our neighbors in housing crises,” says Horne. 1. Talk about how you currently help or could help in the community. If you donate that dollar or spare change to a nonprofit serving the homeless, it could go towards helping find a job, assistance obtaining affordable housing, treatment for medical issues, or case management to directly assist clients in meeting their needs. 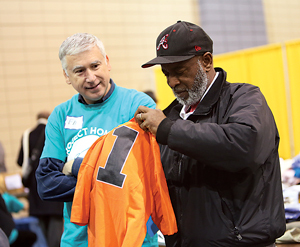 By donating to agencies that help people experiencing homelessness, you can be a part of a solution that is built on best practices for ending homelessness. 2. Call 211 or visit handsonrva.org to find ways you and your child can get involved in a volunteer activity or collection drive that will help people in need. Collect travel-sized toiletries, donations for bus tickets, or canned food for a local food pantry. Talk to your child about how securing these basic resources can help people make ends meet. You might challenge your children to identify a few of their own books, toys, and clothes that might be donated to other children staying in a family shelter. 3. Learn about the issues of poverty and homelessness together by reading books that address homelessness. For older children, you may want to both read the same book and discuss your impressions. Wendy Collins, a librarian at an elementary school that educates many children from low-income families, has put together a suggested reading list. You can find her recommendations at homewardva.org/books. Next articleMeet 3 Moms Who Make it Work!